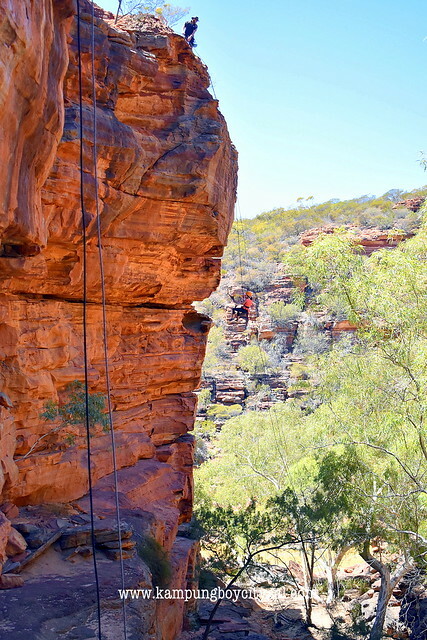 Known for its spectacular natural wonders and rich cultural history, Western Australia is a destination not to be missed. In year 2010 (8 years ago!! 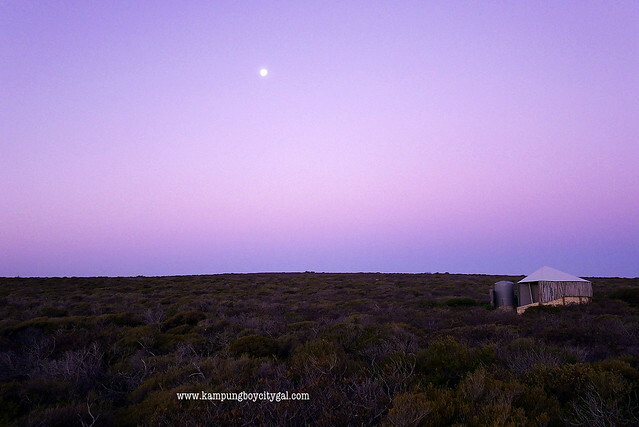 ), kampungboy and I fulfilled our dream to take a road trip from Perth to the state’s South West and spent two nights in Margaret River. 8 years later, I found myself travelling up north to Coral Coast, home to shimmering turquoise waters, mega-fauna, private islands, and outback desert. 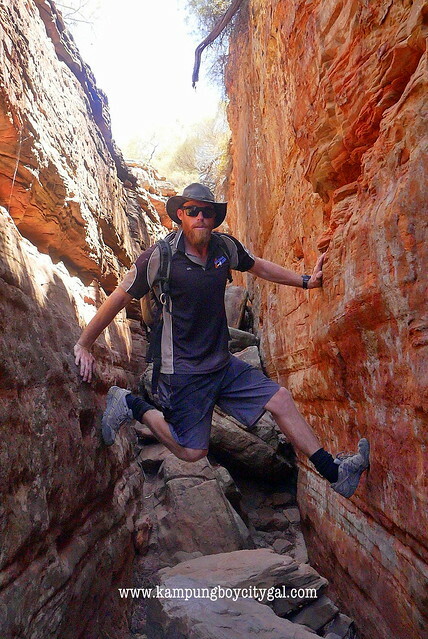 I would never have embarked on this adventure on my own, if not for Tourism WA, thank you so much! Malindo Air flies direct to Perth and the travel time is only 5.5 hours, making WA a perfect destination for Malaysians. 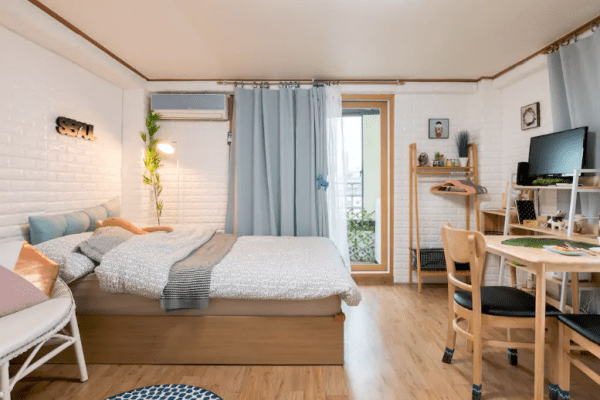 If you only have 3-4 days to spare, Perth + Fremantle is a good option. 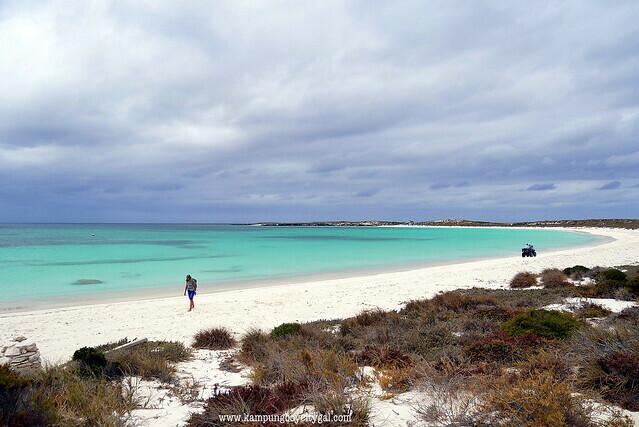 If you have slightly more than a week, it is more fun to do a road trip to Coral Coast or South West. 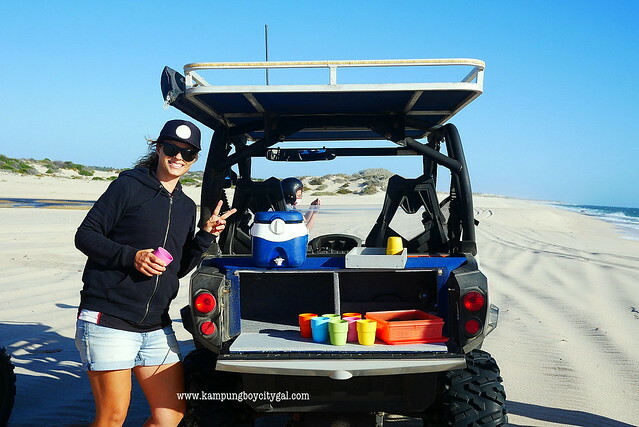 7 Days in Western Australia – Perth & Fremantle here. 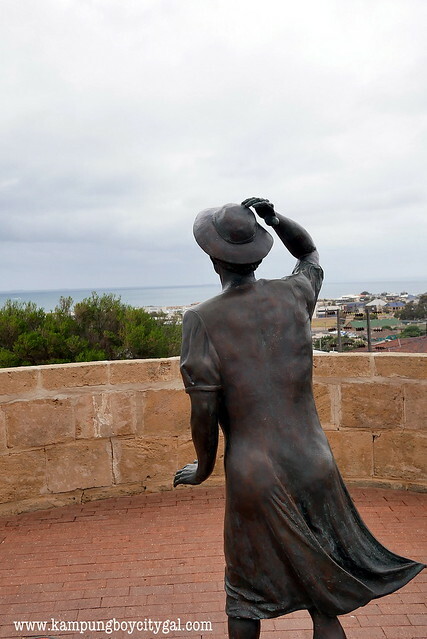 Geraldton is actually 4-5 hours drive from Perth City so it is best to spend a night in Perth City before you embark on your road trip. 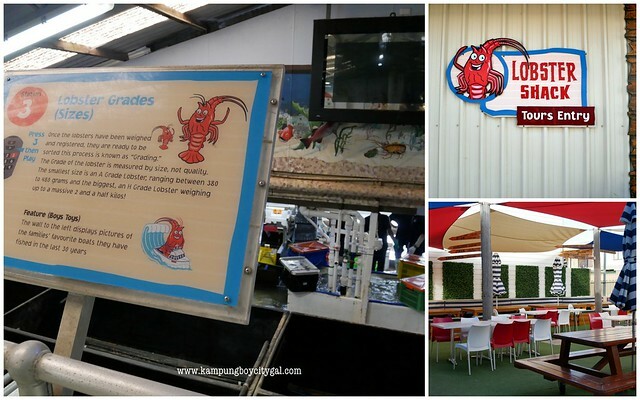 We had a brief refreshment stop at Lobster Shack located on the lovely beach front of Cervantes, just 2 hours drive from Perth. 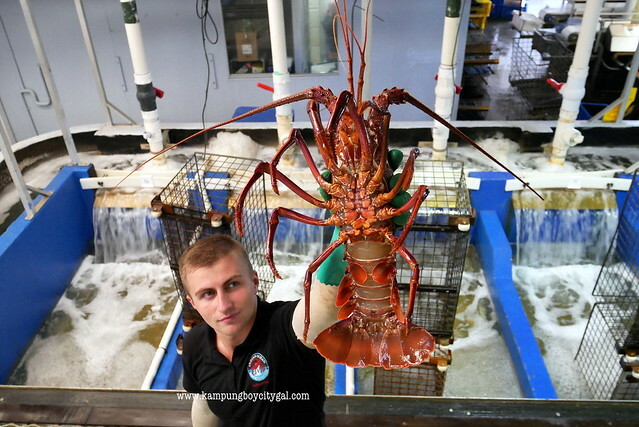 Lobster Shack offers factory tours, seal tours and deep sea fishing tours (at a fee). 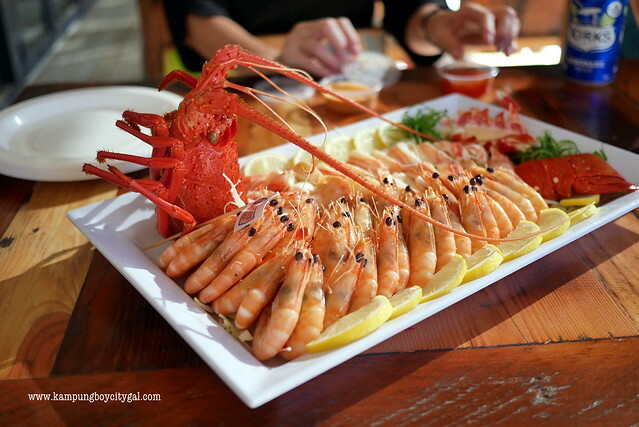 Lobster Shack is the place to be for lobster, seafood and fish dishes. The lobster was prepared in the simplest way and I loved the firm, slightly sweet and nutty flavoured meat. 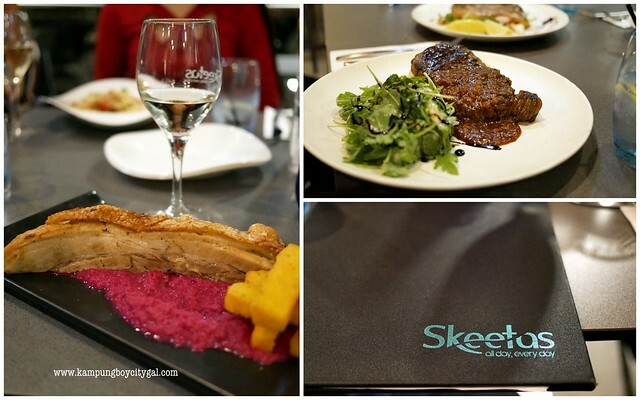 After checking into Ocean Front Hotel, we had dinner at Skeetas on Walkboard. They offered great wines and dishes such as the crab linguine (not pictured), sous vide pork belly and prawn & saffron risotto. 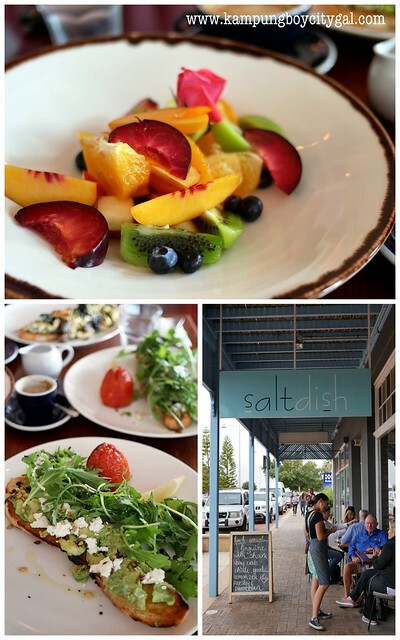 We had our breakfast at Salt Dish that offers fresh seasonal food and great coffee in a charming setting. 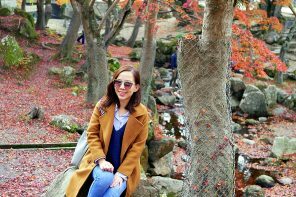 Their avocado toast is one of the best that I’ve ever had! After breakfast, we walked to HMAS Sydney 11 Memorial (1.1 km away). 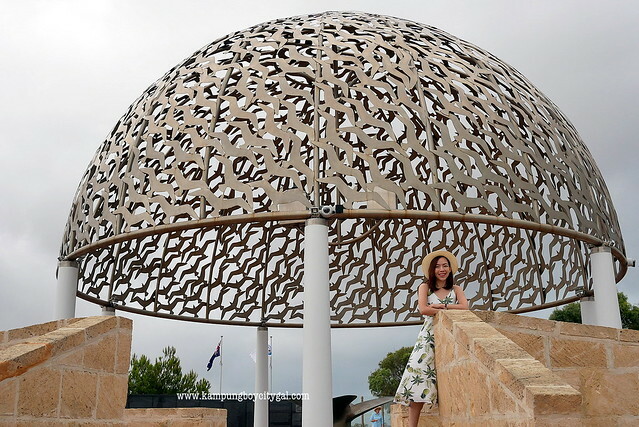 This magnificent memorial site is built in year 2011 to honour the 645 Australian souldiers who were lost of the West Australian coast during a WWII battle. 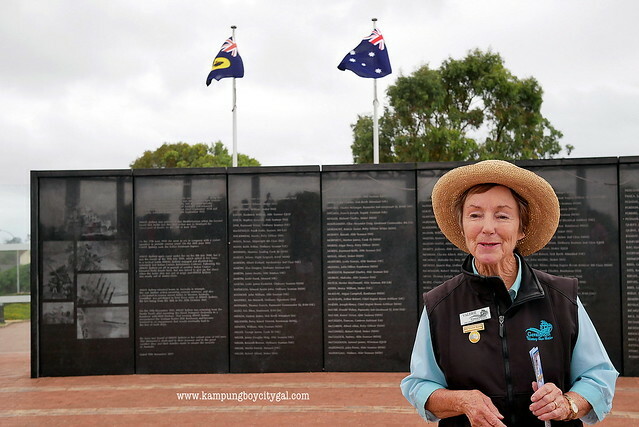 Our guide, Valerie from the Geraldton Voluntary Tour Guides Association offers daily tours of the memorial at 1030 am. 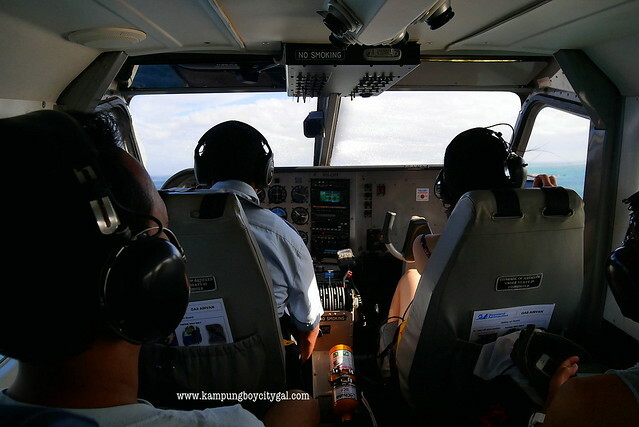 I really look forward to our scenic flight experience, and it lived up to my anticipation. 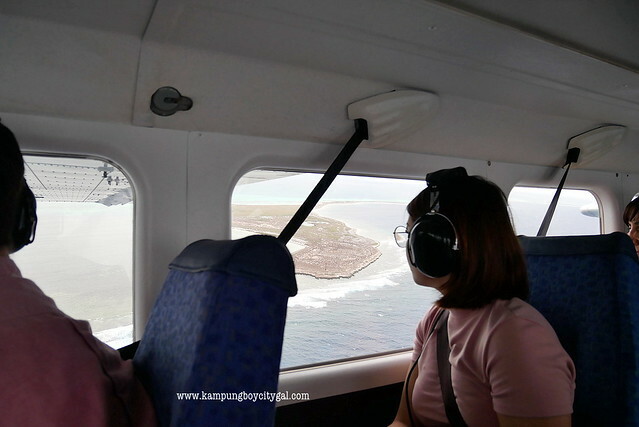 Our pilot personally gave us an overview of the tour including the history of the area and shipwrecks before we departed. He made us feel very safe upon departure and throughout the flight. 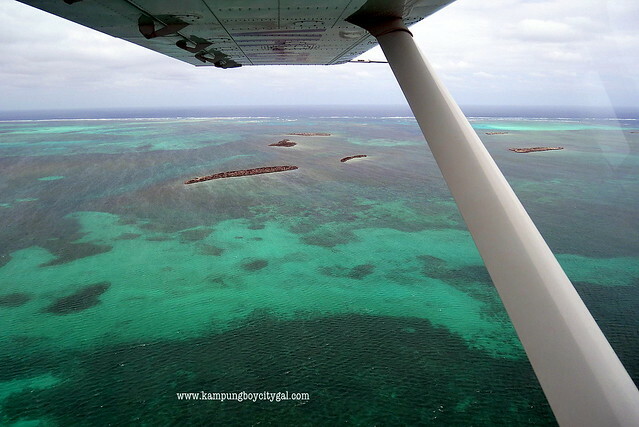 We flew over some of the most beautiful archipelagos before landing on East Wallabi Island for morning tea. We had the whole island to ourselves and the crystal clear water is very inviting. 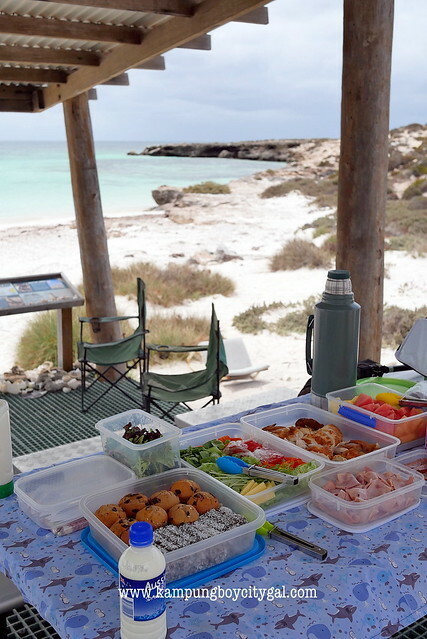 From the landing point, we walked for about 1km to Turtle Bay for a light lunch (included in the tour) of sandwiches, cold cuts, cakes, salad, fresh fruits, tea, coffee and water. 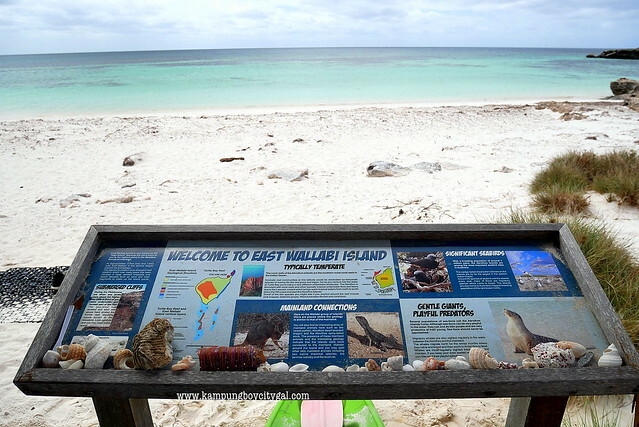 Some of our tour mates went straight into the water to snorkel while we walked around the island, hoping to bump into some wallabies (we did!). 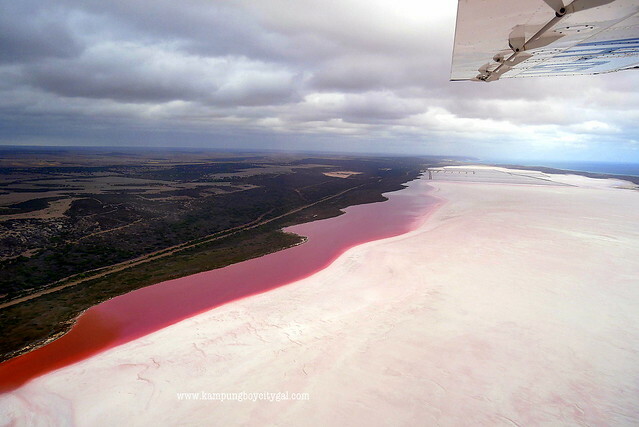 We also flew over Pink Lake (Hutt Lagoon) that is 14 km long and around 2.3 km wide, which makes it be the biggest Pink Lake in Australia. 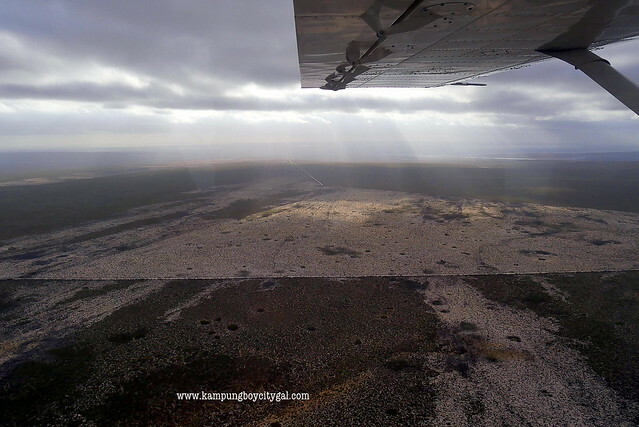 Seeing it from the air is the best way to get the best view and shooting! Love the pink colour gradient! 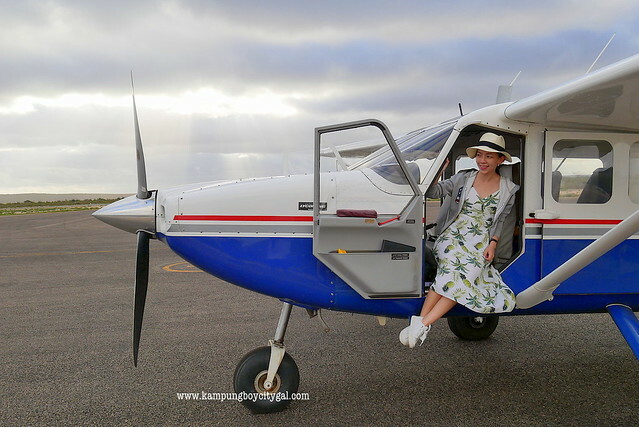 Since this is charted flight with customised route, we were actually flying over Kalbarri National Park into Kalbarri Airport. 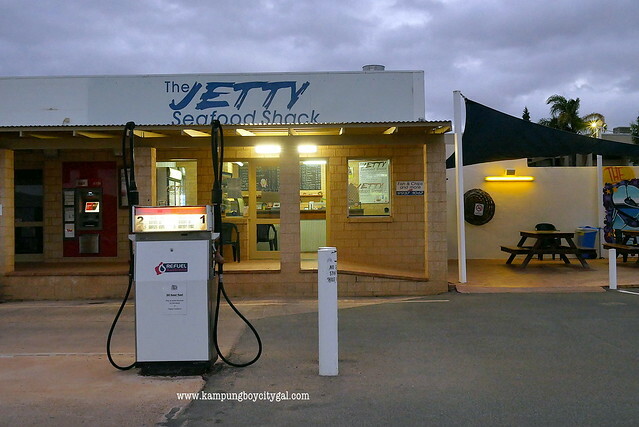 We had our dinner at Jetty Seafood Shack, a casual “take out” style fish n chips place in Kalbarri town. 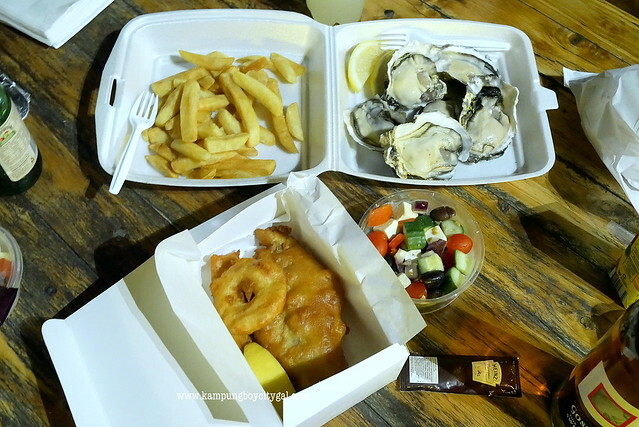 The fish & chips were really good! I really enjoy my fried sea bass with thick cut chip, as well as the pineapple and banana fritters. The best thing is, there is a bottle shop next door, great for BYOB. Rise and shine! 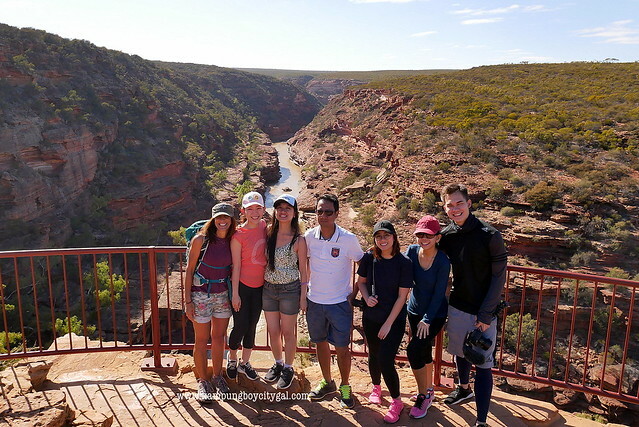 We spent our morning hiking, abseiling, sightseeing, swimming and exploring through the historic Z Bend Gorge in Kalbarri National Park. 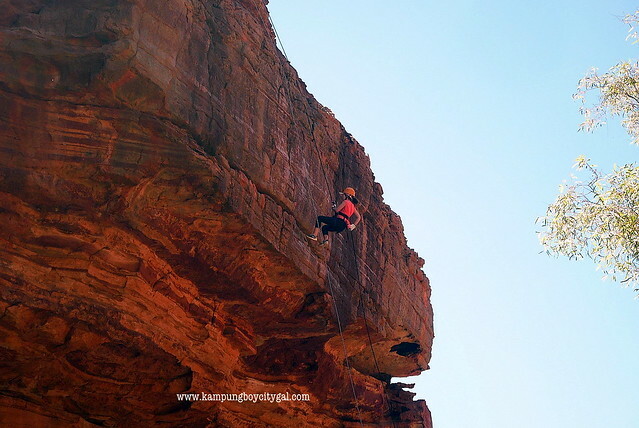 It is one of Western Australia’s best known parks, with its scenic gorges though red and white banded sandstone and its soaring coastal cliffs. 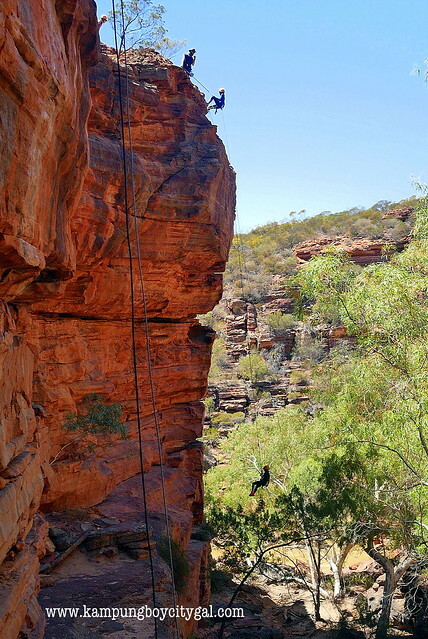 Col and Matt from Kalbarri Abseil Tour picked us up from our hotel. 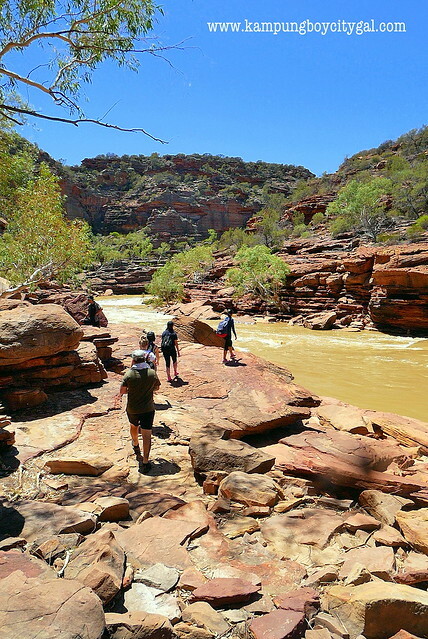 It is very important to pack your own lunch, water, swim wear, sun block and etc into a small back pack because there are no amenities inside the national park. 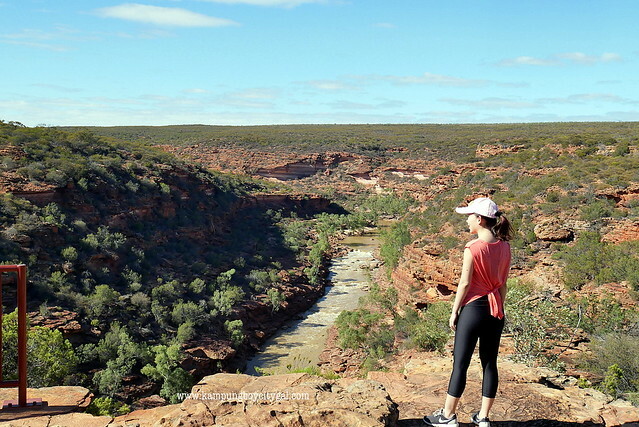 A short hike from the car park took us to a lookout point where we get to take in one of the most breathtaking sceneries in the National Park – the Z-bend. 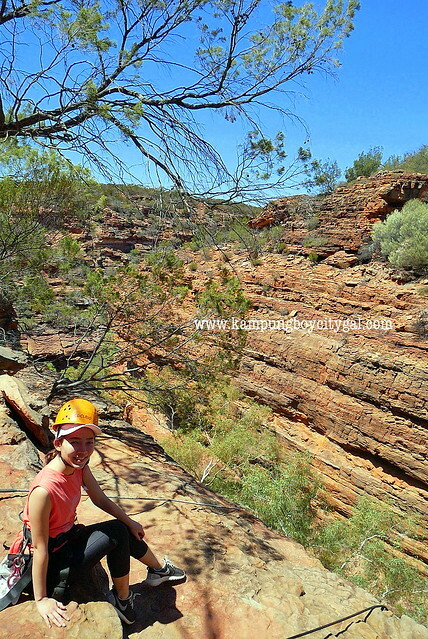 The gorge plunges 150m to the river below where majestic river red gums provide a lush contrast to the earthy hue’s of the Tumblagooda Sandstone. 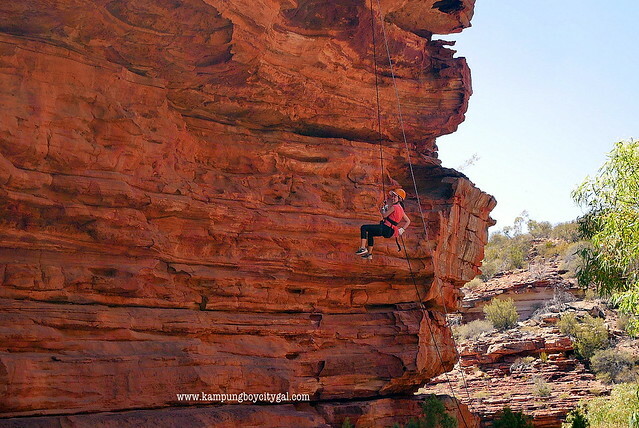 Regardless of whether you are a regular adventure seeker or a beginner in abseiling, this tour is suitable for all. 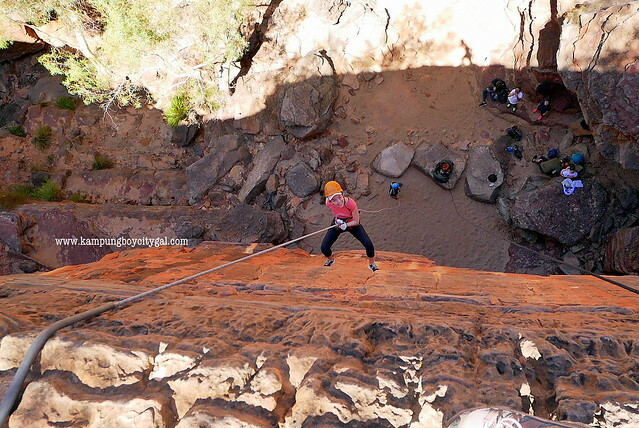 Infact, it was my first time trying abseiling and I was scared to death. Col and Matt are really professional in “coaxing” me. I finally took my first step “backwards”. 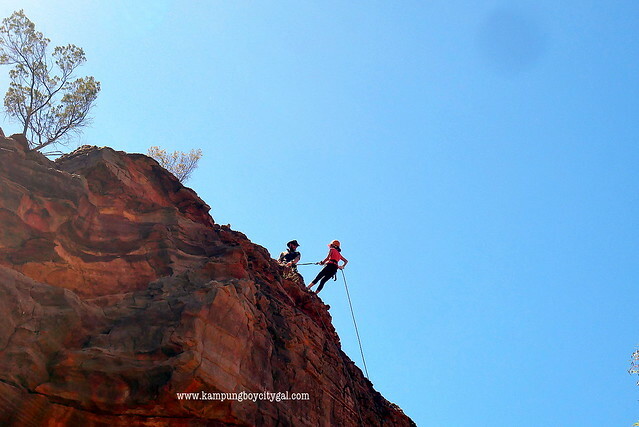 You will need to descend from the edge of the cliff yourself, that was the most difficult part but it is all in the mind. Knowing that I’m in safe hands (proper equipment, professional instructors), I tried 4m, 25m and perpetually 35m. 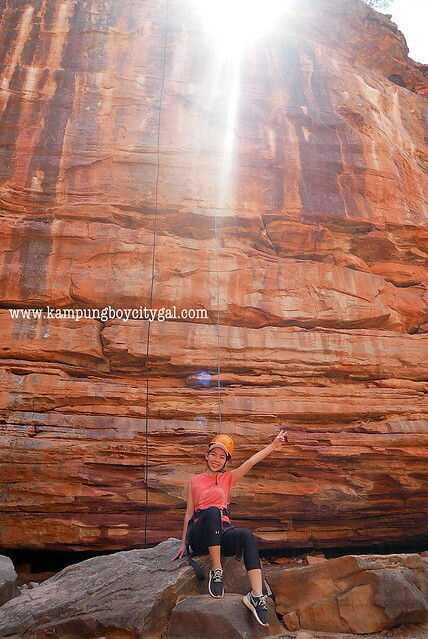 It was really really fun because abseiling is one of the best ways to take in the beauty of Kalbarri National Park. So glad that I did it. Right after abseiling, we hike further down to the river where we had our lunch and swam for a bit. 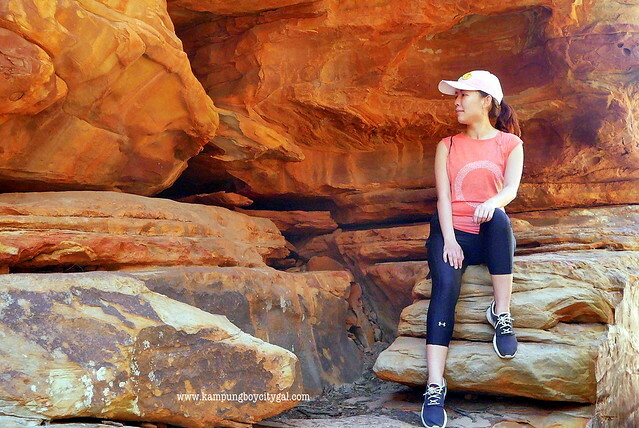 Don’t forget to take soem instagrammable shot at Nature’s Window – a natural rock arch that superbly frames the upstream view. It is about 1.2km return walk from the carpark. Next up! 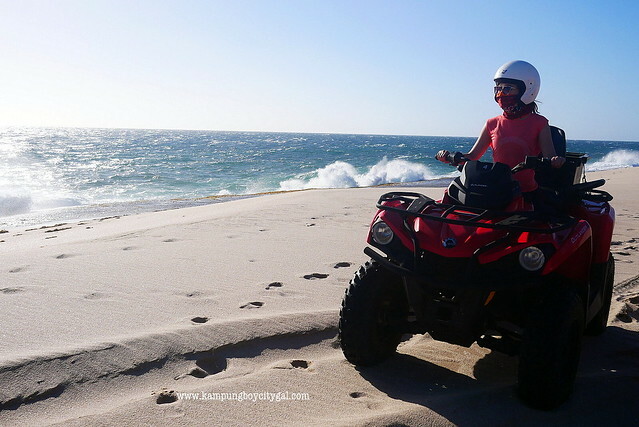 We joined Kalbarri Wagoe Beach Quad Bike Tours for an enjoyable and relaxing drive to soak up the beautiful scenery at Wagoe Beach! 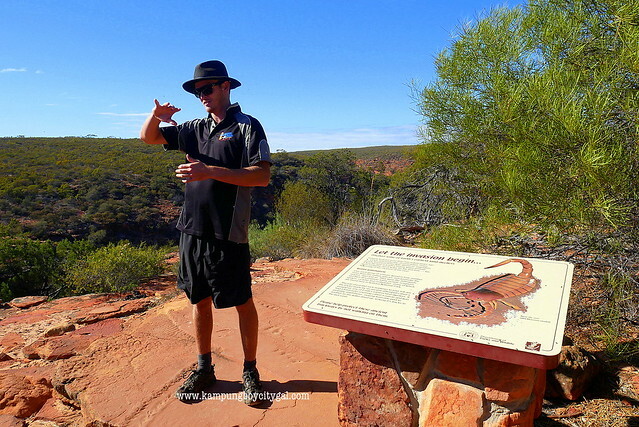 It is a fully guided self-drive Quad Bike & Beach Buggy tour, 20km south of Kalbarri. 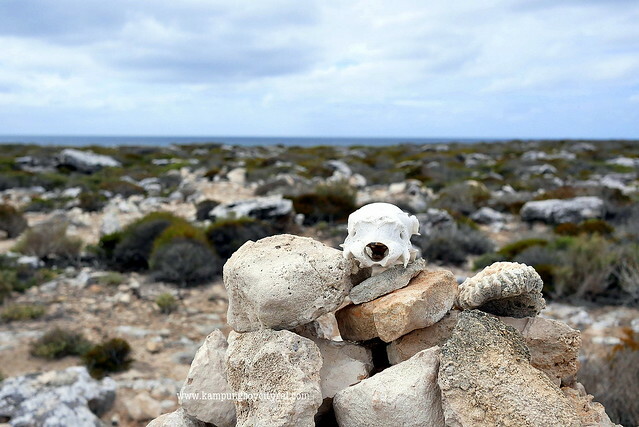 The view along the is amazing, the landscape changes from white sandy beaches to vast sand dunes. We also stop at the Lagoon for afternoon tea. **Please bring your drivers licence as this is required when signing the indemnity forms. 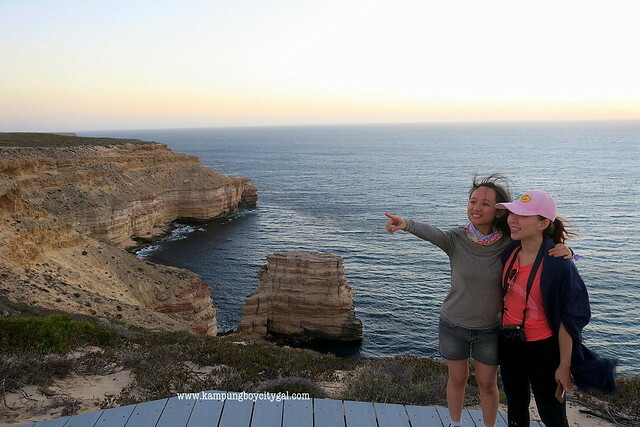 There are numerous sign-posted pathway and lookouts for sunsets in Kalbarri and we visited the Natural Bridge that offers a stunning coastal view against the backdrop of sun setting down. 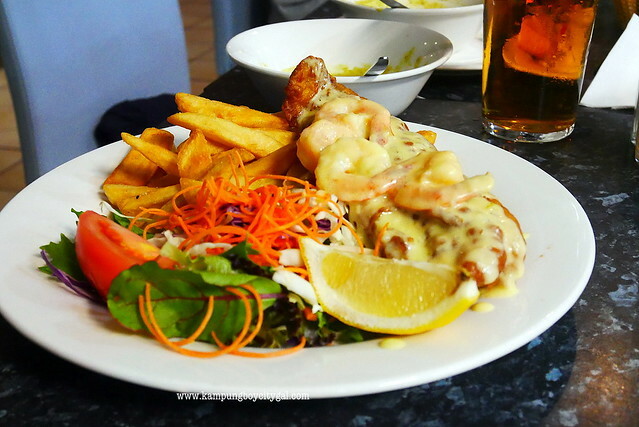 For the best “pub grub” in town, visit Gilgai Tavern. 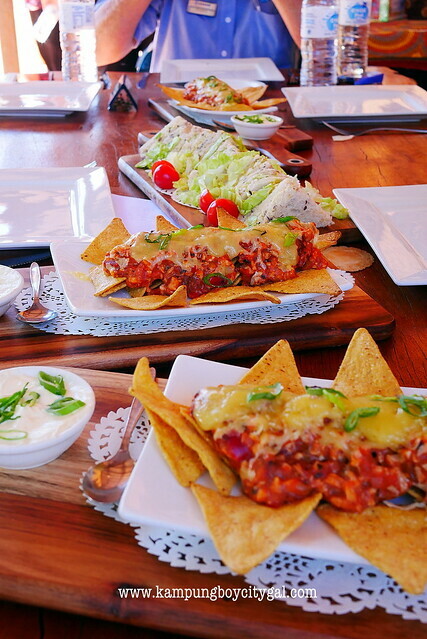 They have a vast menu with plenty of choices and the portion is humungous! Pink Lake is definitely one of the coolest and most Instagrammable locations in Western Australia. The Lagoon is a salt lake with a pink hue due to the presence of the carotenoid producing algae, Dunaliella salina. Depending on the time of day, the season (time of year) and the amount of cloud cover, the lake changes through the spectrum of red to bubble-gum pink to a lilac purple. The best time of day to visit is mid-morning or sundown. We also visited Chapman Valley Fishing Park and tried our hands on fishing at their catch and release fishing park. Well, we caught nothing but the awesome morning refreshment made up for it. 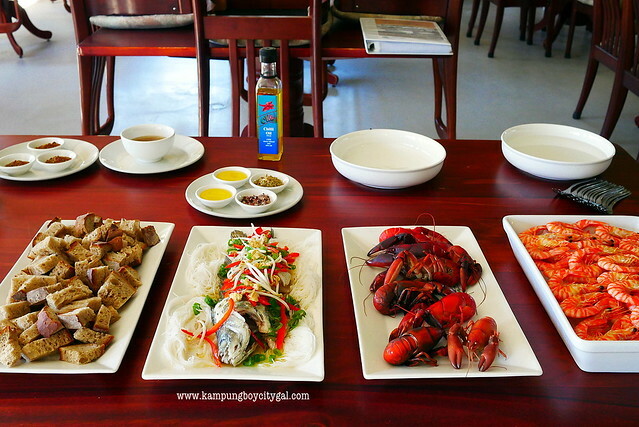 Love those sweet tasting crayfish and steamed fish. So delicous. 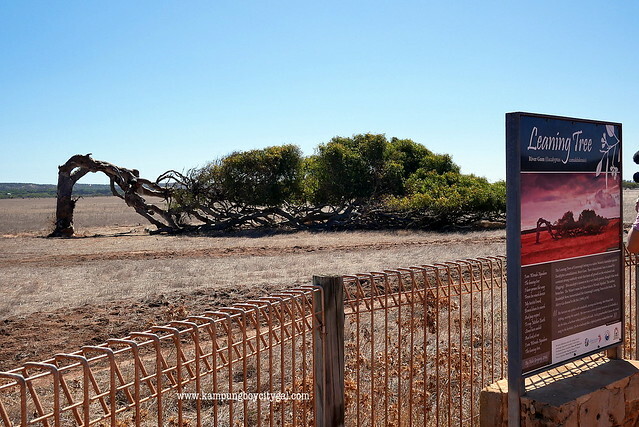 Not for the faint of heart – Oakabella Homestead is classified by The National Trust as one of the most haunted properties in Western Australia. We joined in on a guided tour through the original 13 room homestead and outbuilding, including the unique two-storey buttressed barn, which now serves as Oakabella’s museum. The owner told us many eerie stories of the spirits who are currently occupying the house. 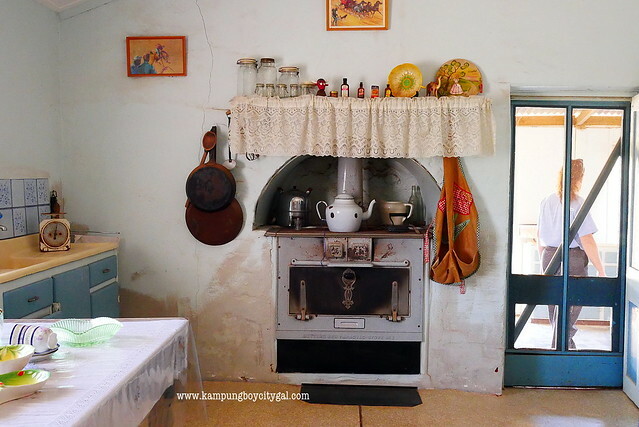 If haunted house is not your cup of tea, you can enjoy a cafe style lunch of home made panini, nachos and toasted croissants, including tastings of home made and local preserves and jams at the tearoom. bizarre natural phenomenon is caused by the airborne salt content blown in with the winds off the Indian Ocean. 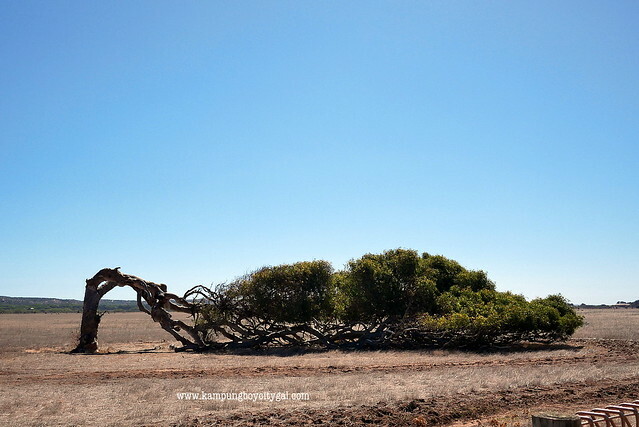 The tree trunks lie horizontal to the ground and have become somewhat of an icon for the area. 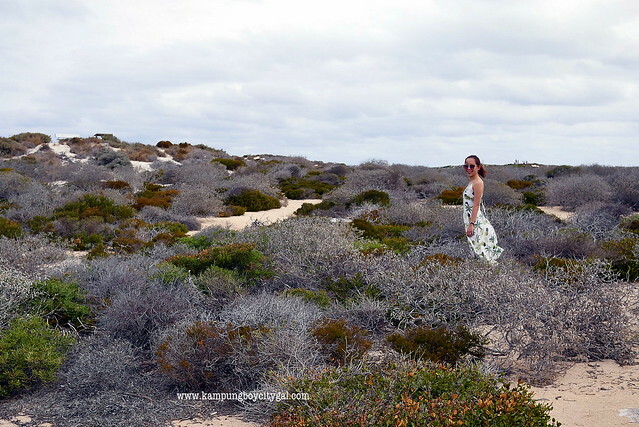 After checking into Pinnacles Edge Resort, we drove to The Pinnacles Desert in Nambung National Park. Sunrise or sunset is the best time to go, the landscape looked quite surreal under a golden hue. Formed over millions of years, thousands of tall limestone spires rise eerily out of the yellow desert sands. 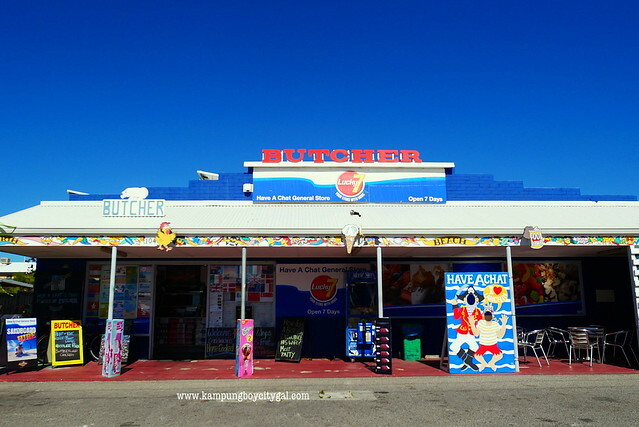 We rented the sandboards from “The Butcher” in Lancelin town centre as we were heading to the Lancelin Sand Dunes for sandboarding. 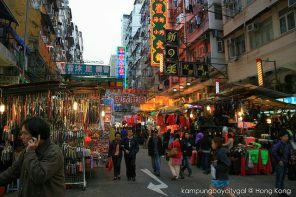 The rental cost is AUD 10 with a deposit of AUD 50. 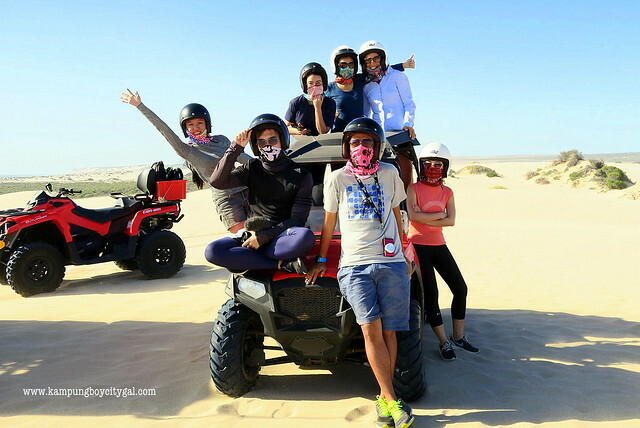 It was my third time trying sand boarding is so so so fun! Great place to take picture too, against the backdrop of sand dunes and clear blue sky. 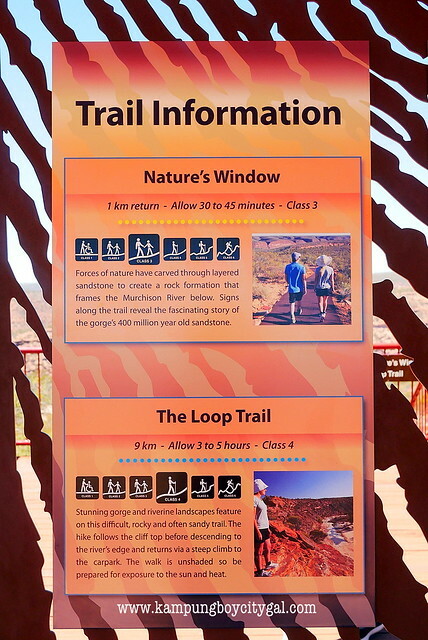 Be prepared to get really tired as the walk up the sand dunes are tougher than imagined. 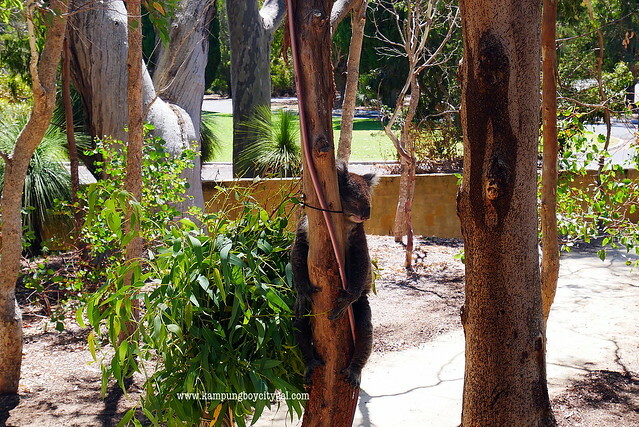 Located just 45 minutes from Perth, Yanchep National Park is a popular getaway spot for the city dwellers. 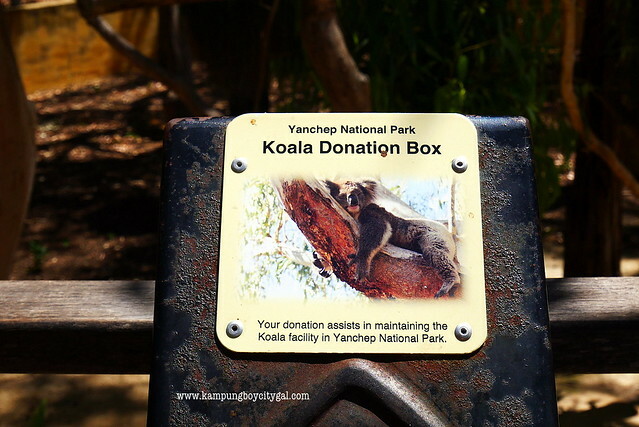 We strolled the 240-metre koala boardwalk to view one of Australia’s favourite native animals in a natural environment. 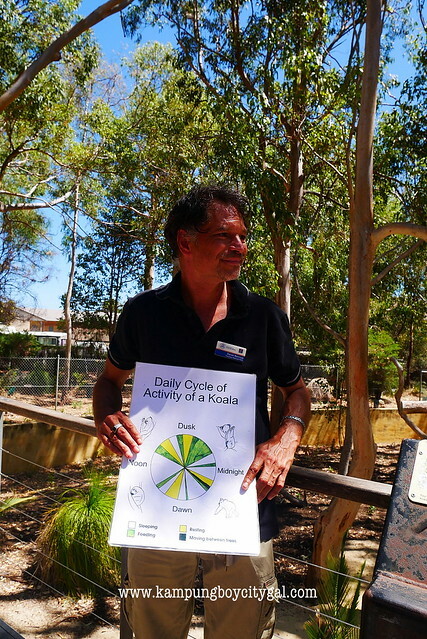 We also joined Derek on the Wanga Mia Aboriginal cultural tour and discover the culture of the Noongar people of Western Australia’s southwest: their seasonal movements, language and how knowledge is passed from generation to generation. What an eye opening experience! 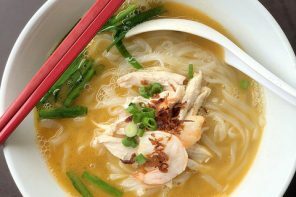 This is followed by a lunch at Yanchep Inn, remember to order their duck rice – it was delicious!